My cast iron skillet is one of my favorite pieces of kitchen equipment, not only because it belonged to my granddaddy, but also because it gives whatever I cook in it a beautiful crustiness that one cannot get in a non-stick pan, for instance. I use the skillet for meat that is perfectly browned and delicious (try searing and cooking a steak in melted butter in a cast iron skillet. So good.) or for occasionally frying chicken tenders or country fried steak. Oh, and biscuits…can’t forget the biscuits. Melt a couple of tablespoons of salted butter in the bottom of the skillet as it preheats in the oven, then add the biscuits to the pan to bake…again, you get a perfect, golden crust on the bottom of the biscuits. Such a treat! Cast iron skillets aren’t just for creating a perfect crust on meats and biscuits, though. Vegetables do well in them, too, without the tendency to turn mushy. Try two of my favorite ways to cook vegetables in your own skillet. Also, if you need to learn how to season your cast iron pieces, click here to see Southern Living magazine’s simple method. 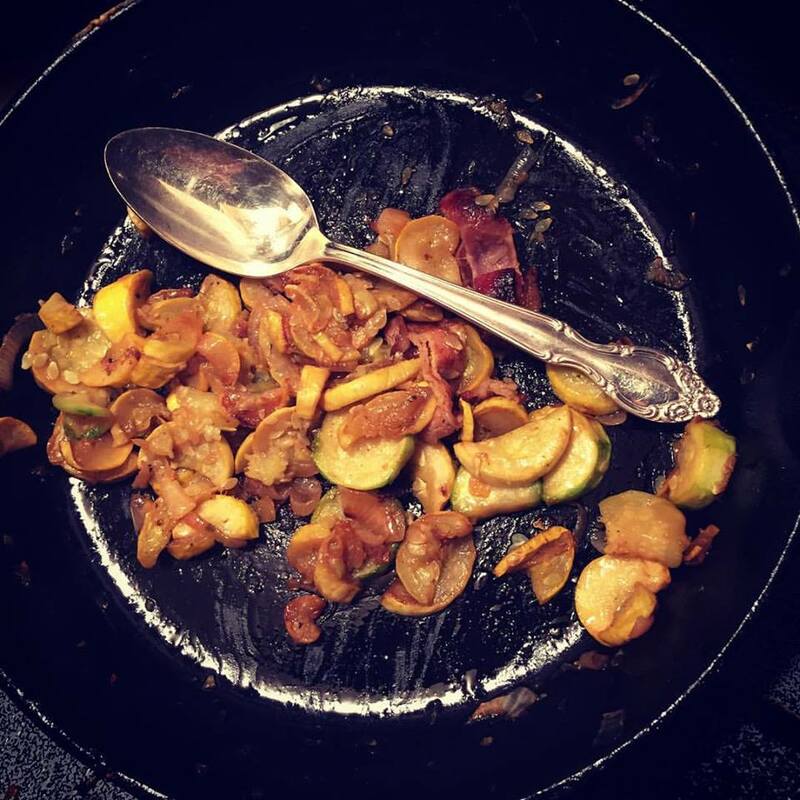 First, I’ve been enjoying using my skillet to cook yellow summer squash until it develops a golden crustiness on the outside, and creamy tenderness on the inside. Many Southerners, my parents included, always boiled their summer squash, cooking them, sliced, with onions in water in a saucepan. I never have really liked that; I think it does a disservice to a vegetable that has such a nice, tender texture to boil it to a drippy mush. I make my own squash using the following method lately, which really does let the squash’s flavor and texture shine! 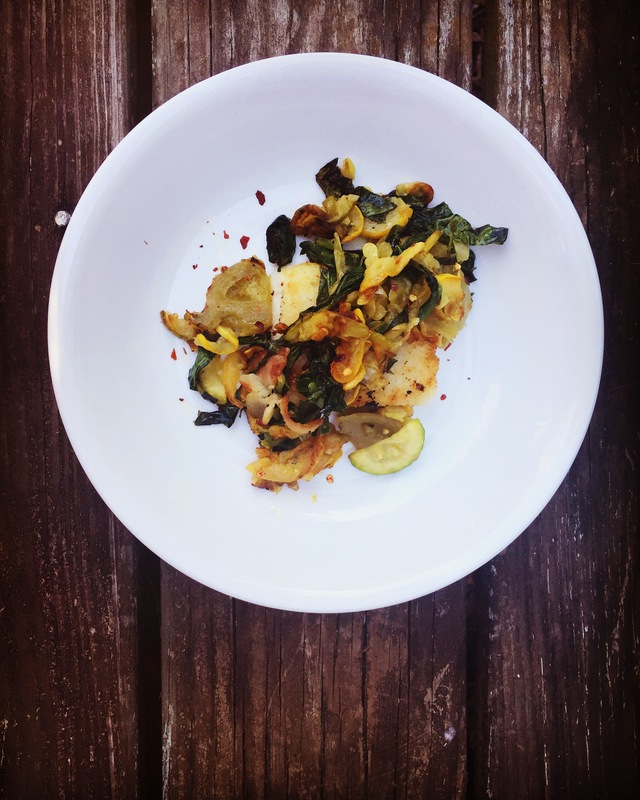 These are simple Southern-favorite ingredients…squash grows bountifully in the warm soil in every neighborhood I’ve ever lived in, as does zucchini, which is able to be cooked similarly to yellow squash. Collard greens have been a staple for many generations in the south (they’re especially flavorful in cool weather), and grits are one of the most revered/misunderstood/under-appreciated Southern foods that exists. (I completely love good grits, and I hope you’ll try them, too. Just not instant, because they’re truly terrible and not a real representative of what grits are intended to be). Put these ingredients together in your skillet and you’ll have a side dish that you and those who gather at your table will devour. 6 or 7 small to medium-sized squash – Yellow is the best in this application, but zucchini can be subbed in for a few of them – washed and cut into thin half-moon slices . Drop chopped bacon into an 8- or 10-inch unheated skillet. Begin frying bacon over medium heat, allowing to warm for a few minutes until it begins to release its fat. Add slivered fresh greens and chopped tomatoes to the pan. Continue to sauté the vegetables, tossing gently until the greens have thoroughly wilted, about 5 minutes more. Carefully taste mixture without burning your tongue, and add salt and pepper as desired. Serve mixture over hot grits, rice or even meat, such as pan-fried or baked catfish. Make your favorite grits (do not use instant grits) according to package directions. I made enough for four servings, according to the package directions. Make sure to add salt at the beginning of cooking so it will absorb into grits. I also add a little sprinkle of garlic powder and 1/4 tsp red pepper flakes to the pot at the beginning of cooking. When grits have thickened, take off heat and spread into a baking dish that you have coated with cooking spray.I used a 9×13 pan so they’d be a bit thin; do it however you’d like. Smooth out the top of the grits, and allow to completely cool. (I prepare this the night before and cool in the refrigerator). When ready to pan fry, cut firm, cooled grits into squares. 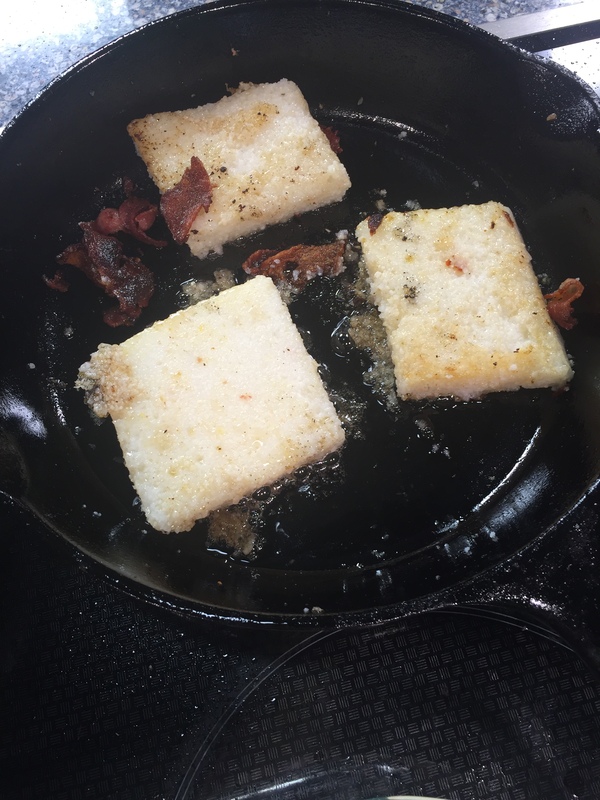 Add individual grit squares into a skillet with hot bacon grease, butter, or olive oil, making sure oil is hot at the beginning so that it does not completely absorb into the grits. Watch for spattering oil! Fry for about three minutes on each side, until golden brown, and remove to a plate lined with a paper towel or a cooling rack. Serve topped with your beautiful vegetable sauté. They are also perfect for breakfast, topped with a sunny side up egg and sprinkled with crumbled bacon, for example. My butternut squash recipe is a wonderful idea for fall, especially, when these winter squashes are at their sweetest. You can peel and cube a whole squash, or you can buy a bag of pre-cut squash cubes in the produce department of many grocery stores now. Just make sure the cubes don’t look mushy or like they’re wet. Fresh squash won’t be drippy or slimy. Turnip greens are also available prewashed and bagged, which saves a lot of work and time. Place oil in skillet, and begin warming over medium heat. Add the greens to the pan, plus 1/2 cup water to help steam the leaves. Sprinkle greens with the vinegar, and allow to panfry, stirring every few minutes, to make sure all sides of cubes have the opportunity to develop a crust. After 10 minutes, taste for proper seasoning and tenderness. As you continue to cook, make sure not to allow the squash to scorch; add water as needed. Serve when desired tenderness is reached. 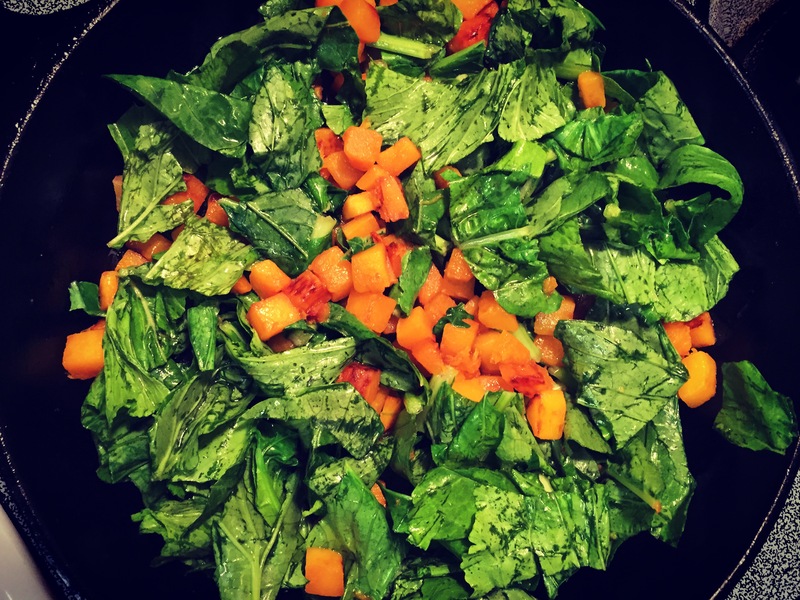 This delicious squash and greens combo is a favorite of mine for breakfast, believe it or not, topped with a sunny side up egg. Over grits? Also fabulous. Give it a try and let me know what you think! Y’all may or may not know how much I love finding good junk…I mean, discovering a vintage treasure…each weekend as I explore new shops and sales. I thought I’d begin sharing with you when I have a new find as I treasure hunt, because I know many of you love vintage items for your home, too. This weekend was the Highway 80 sale, a huge event that runs through five states, and I happen to live in an area of Texas that Highway 80 runs right through. My sister and I did some digging in one particular area of Mineola that had a warehouse full of items, from junk (broken plastic toys) to treasure (a vintage refrigerator from the 1950s in immaculate condition). 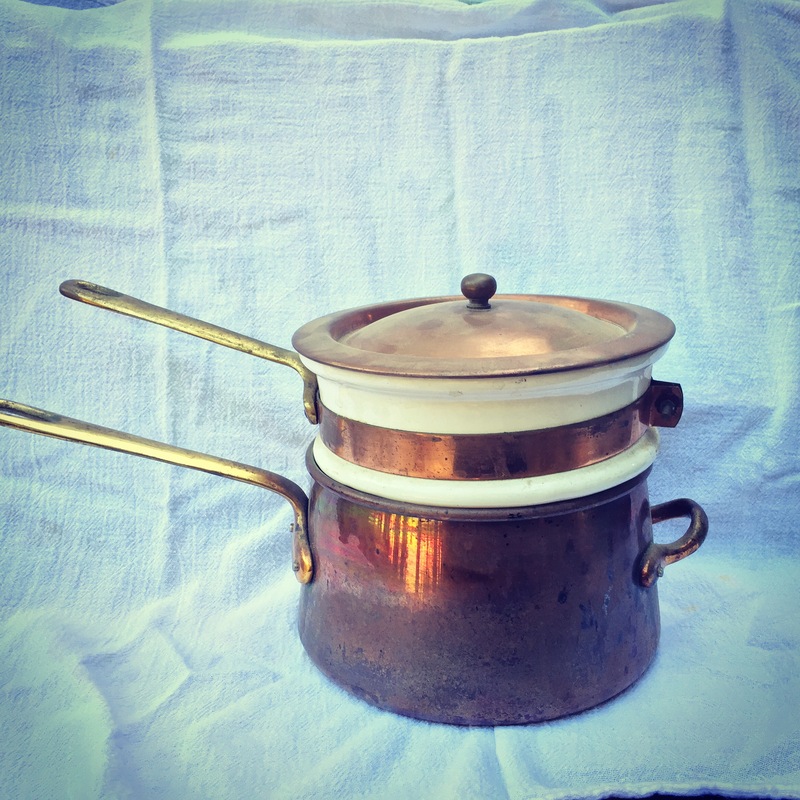 My happiness was found in a pile of kitchen castoffs in the form of this copper and porcelain bain Marie…or double boiler. I’d been looking for one, and found this one on a table in three separate pieces. Perhaps the junk-er didn’t know how it went together. It had a big piece of duct tape as a price tag reading $8. SOLD to Mama Steph! Make sure to share your favorite finds with me! MamaSteph@kltv.com or here in the comments. Happy hunting! Hi Netha, I’m sorry you aren’t enjoying the recipes. I have unsubscribed you. Have a great day!